Italian greyhounds are one of the most loyal dogs in the world. They ADORE their owners. They stay VERY playful well past puppyhood. They are a long-lived breed (12-14 years average, 14-18 not uncommon and I’ve known of two that have lived to 21 years of age). They LOVE to give and receive affection. They have a short coat that requires minimal grooming. (Notice, I said the “coat” requires minimal grooming – keep reading). They ADORE their owners, meaning they will follow you everywhere. They will want to be on you, next to you, lick your ears, your nostrils, etc… You will never be alone again, not for a second. For the men: My husband has nicknamed IGs “crotch crushers”. For some reason, no matter what angle they are jumping from – they will land, well, on your “twigs and berries”. They are VERY intelligent – and will be more intelligent than you, if you aren’t careful. They can be master manipulators and you’ll be second in command before you know it. They are VERY athletic. They can scale a six foot fence if motivated and can squeeze through the tiniest of openings and steal your Thanksgiving turkey off of your kitchen counter, or the cat food off of the top of the washing machine and can catch, birds, opposums, lizards, snakes, rabbits, squirrels and just about anything else that catches their fancy, and is small and not faster than them. They are playful well past puppyhood. You will still be waiting for them to “calm down” when they are 2. Mine usually start to mellow a bit between 5 and 8 (YEARS). They are long-lived. Are you willing to make this long of a commitment? Nothing makes me angrier than a dog being turned into rescue because it is old. Except maybe someone turning a dog into rescue that is old and has never had proper care and fully expect that I have a long line of people just waiting to adopt old dogs with no teeth and health problems. (Anyone who thinks that can contact me about some swamp land I have for sale in Arizona). They love to give and receive affection. When they want it, not when you decide you have time. If they do not receive the attention they need, they can become destructive and have behavior problems. What they don’t require in grooming, they require in dental attention. I brush my dogs’ teeth daily. Failure to provide adequate dental care will result in breath capable of wilting flowers and bacteria flowing through your dog’s bloodstream that can result in other health problems. Bone loss due to poor dental care can also predispose the dog to jaw fractures. Housetraining. Yes it can be done with an Italian greyhound and most people start with a positive attitude towards it – yet, it is one of the biggest reasons that Italian greyhounds are relinquished to rescue. 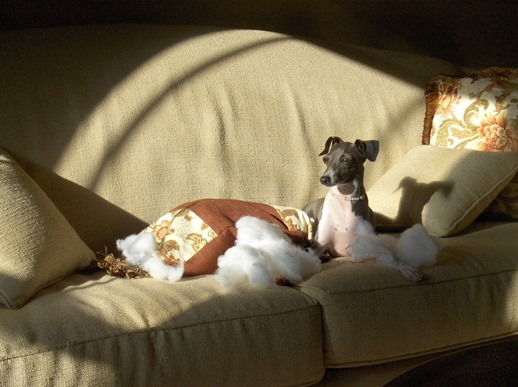 If you expect that your Italian greyhound will be completely housetrained in a few short weeks or that your dog will bark and scratch at the door to go out – or that the dog you got from the breeder or rescue which was housetrained in its former home will be fine in your home with little or no work on your part – THINK AGAIN. Italian greyhounds have a small gene pool. While the breed is hardy – there are significant health problems that affect this breed, many of which do not show up until the dogs are between 3-5 years of age. While responsible breeders do their best to screen their dogs of problems, the risk is still there. It is unavoidable due to our limited gene pool. Buying from a responsible breeder will minimize your risk. Beware of health guarantees of only a year. Do you have $1,500.00-$3,000.00 set aside in case of a leg break? While leg breaks aren’t as big of an issue in the breed as they once were – they are still a possibility with a breed like the IG that has long slender legs and thinks it can fly. You must be prepared for the possibility and be able to deal with it financially. Italian greyhounds can be escape artists and should not be allowed to run off leash in an unsecured area. If they get spooked or decide to give chase to something – you will not catch them unless you are the Bionic Man, Flash, Superman or have other superhuman abilities.